The title that Frederik L. Schodt chose for this lecture, Cultural surfing: Riding the waves of transnational history, technology, and pop culture, describes the long career he has led using his superb Japanese language skills to serve as a bridge for cultural exchange by riding the many waves that have tied Japan and America together over the years. 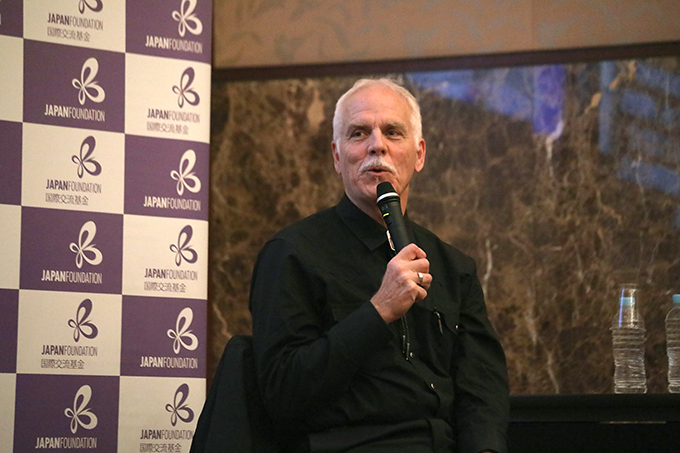 Schodt, a translator, interpreter, and researcher gave his commemorative lecture on receiving the Japan Foundation Award on October 20, 2017 at the main hall of the Japan National Press Club. I was given the opportunity to serve as moderator for the lecture and to look back on his achievements of over the past 40 years. The hall was full and the audience included several high school students from Schodt's alma mater. 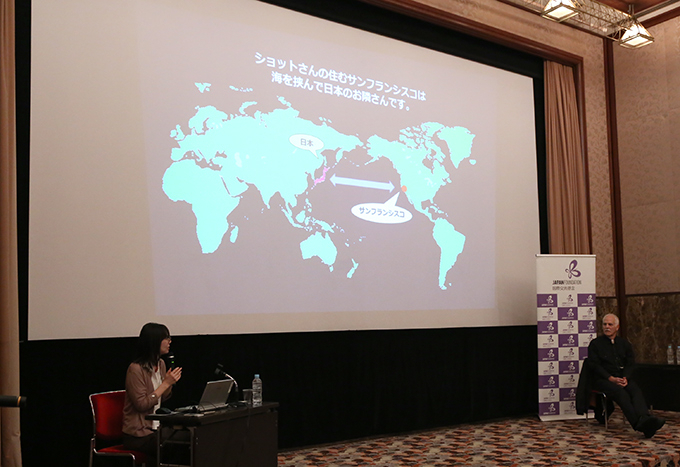 The lecture consisted of two parts, with the first half covering his manga-related work and the latter half covering his research into the history of Japan-U.S. relationship. I asked Schodt various questions while following a presentation I prepared for the occasion. Japan Foundation Awards 2017 Commemorative Lecture by Frederik L. Schodt (October 20, 2017). 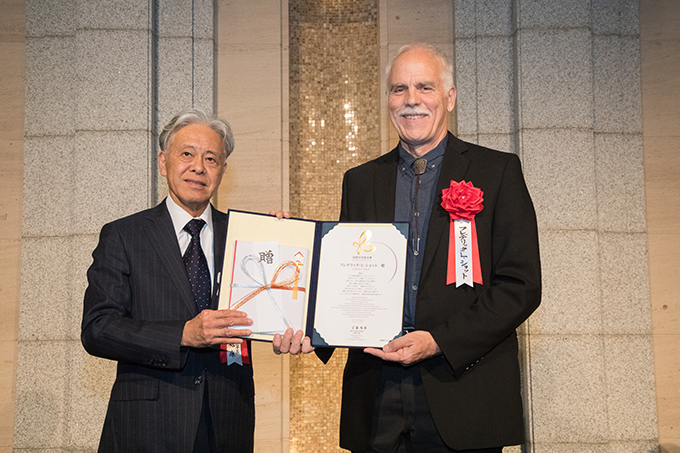 As described in the reason for awarding Schodt the Japan Foundation Award, Schodt was a pioneer in introducing Japanese manga to the U.S. in the 1970s. 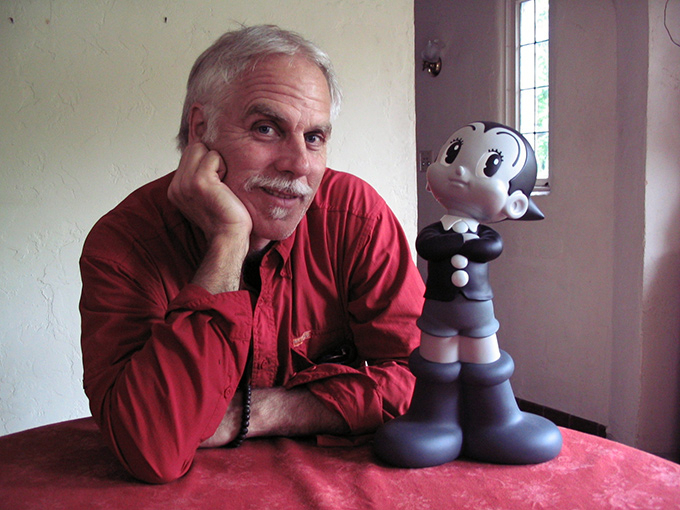 Schodt fell in love with Japanese manga while attending the International Christian University as an exchange student, and his subsequent translations of numerous Japanese manga, such as Phoenix by Osamu Tezuka and Ghost in the Shell by Masamune Shirow, became well known among fans for their high quality. Schodt previously gave a lecture in February 2017 to commemorate the publication of his translation of The Osamu Tezuka Story *1. For details, please read the related article *2. Schodt is also known for his particularly deep relationship with the famed manga author. Takayuki Matsutani, President of Tezuka Productions described in his speech at the Japan Foundation Awards ceremony that Tezuka had the deep trust for Schodt as an interpreter and translator of his work, noting that Tezuka was known to have said, "I only work with Schodt." Incidentally, when I asked Schodt which translation left the greatest impression on him, he responded that it was Astro Boy. He explained that he was deeply moved with the renewed understanding he gained of Tezuka's deep insight and foresight through rereading Astro Boy for the publication of the English translation in the U.S. in 2002. Schodt's achievements in fact extend beyond translation and include research as well. The publication of his work Manga! Manga! The World of Japanese Comics *3 was published in 1983 at the time long before the Japanese manga culture has been developed commercially in the U.S. Today, 30 years after that work's publication, it is still essential reading for any researcher on Japanese manga. At the awards ceremony for the Japan Foundation Awards 2017 (October 16, 2017). Through his work to introduce culture through manga, Schodt gradually turned his attention to the past, including the history of cultural exchange between Japan and the U.S. It would be no exaggeration to say that the existence of the Four Immigrants Manga (English translation published in 1999) *4, a visual diary of the experiences of a Japanese artist who traveled to the West Coast of the U.S. in the early 20th century, was made known to the American public through his efforts, leading to its simultaneous publication in Japan and the U.S. The English translation, which includes ample notes on the historical background and local conditions at the time, is far more than a simple translation and instead vividly describes scenes of the history of Japanese migration to the U.S. Schodt has also highlighted other lesser known episodes in the history of cultural exchange between Japan and the U.S. Such works include Native American in the Land of the Shogun: Ranald MacDonald and the Opening of Japan (2003) *5, in which he researched Ranald MacDonald, an American and the first English teacher for the Tokugawa Shogunate (1603-1868), who risked his life to visit Japan while the country had been closed off to the outside world before the Perry Expedition (1853-54), as well as Professor Risley and the Imperial Japanese Troupe (2012) *6, about a showman who organized a Japanese circus and made it a popular form of entertainment throughout the world shortly after Japan opened its country to the world. During the lecture, Schodt explained that "Ranald MacDonald is my Hero," and this passion seemed to be directed at the many people who have immersed themselves in a foreign culture and overcome challenges in the pursuit of cultural exchange, as well as at their achievements. Schodt's lecture spanned a range of topics from his introduction of Japanese culture through manga to the history of cultural exchange between Japan and the U.S.
Schodt now calls San Francisco home, which itself has a history of intercultural exchange with Japan, resulting from numerous shipwrecked Japanese vessels washing up on nearby shores, even before the opening of Japan. Schodt has spent his life to date connecting Japan and the U.S., neighbors across the ocean with a long history of cultural exchange. I look forward with tremendous excitement to seeing his future work. *4 The Four Immigrants Manga: A Japanese Experience in San Francisco, 1904-1924, Henry Yoshitaka Kiyama, Stone Bridge Press, 1999. As the text contained in the original edition includes both English and Japanese, there are also separate English and Japanese editions that unify the text into the respective language. The Japanese edition, entitled Manga Yonin Shosei (Yoshitaka Kiyama) was published by Bunsei Shoin in 2008 and Shinpu Shobo Co., Ltd. in 2012. Born in the U.S. in 1950, Frederik L. Schodt became captivated by Japanese manga while studying at the International Christian University as an exchange student in the 1970s. He has contributed to spreading numerous Japanese manga works overseas, starting with Astro Boy by Osamu Tezuka and including also works by Riyoko Ikeda, Leiji Matsumoto, Masamune Shirow, Yukinobu Hoshino, and Naoki Urasawa, through his individual and joint translations, writing, lectures, and interpreting work. He is known as the man who set off today's boom in manga popularity in the U.S. In recognition of his meritorious contributions, he was awarded the 4th Tezuka Osamu Cultural Prize Special Award in 2000 and the Order of the Rising Sun, Gold Rays with Rosette, in 2009. His most recent translation is The Osamu Tezuka Story: A Life in Manga and Anime. Yukari Shiina is an English to Japanese translator of overseas comics and a part time instructor at the Tokyo University of the Arts. She completed her Master of Arts in Popular Culture at Bowling Green State University in Ohio, the U.S. She also worked as a manga research assistant at the Arts and Culture Division of the Agency for Cultural Affairs from 2011 to 2013. 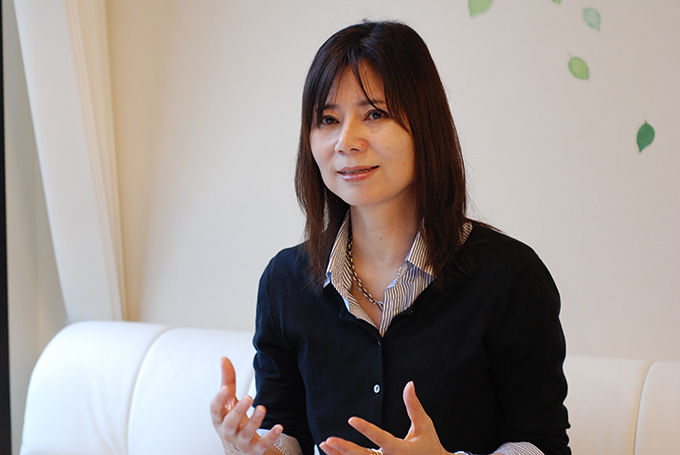 She has translated overseas comics and research papers and written on the state of comics overseas. Her translations include Fun Home, a Family Tragicomic (recipient of the Excellence Award in the Manga division at the 15th Japan Media Arts Festival), Black Hole, Saga, and The Boys. How did Japanese-language Education Develop in Brazil, the Home of the Largest Nikkei Community?